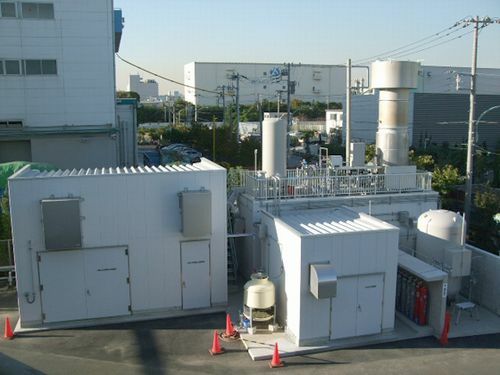 Tokyo Gas Co., a major gas supplier in Japan, and Bio Energy Corp., a food recycling plant operator, announced on January 26, 2011, that they started feeding biogas refined and processed from food waste into the city pipeline system, ahead of all other companies in Japan. Approximately 800,000 cubic meters of gas (under standard conditions)--enough to accommodate about 2,000 ordinary households--will be fed into the pipeline system annually. This is expected to reduce about 1,360 tons of carbon dioxide emissions a year. The raw biogas (methane: 60%; carbon dioxide and other gases: 40%) is produced from food residue at the methane fermentation plant of Bio Energy in Ota Ward, Tokyo, the largest food residue methane fermentation plant in Japan. The biogas is then refined into methane gas and processed to the natural gas quality supplied in the city, including caloric value and composition. The required equipment for this work was installed with a subsidy from the Ministry of Economy, Trade and Industry as a verification project for feeding biogas into a city gas pipeline system. In order to further contribute to global warming prevention through increased use of new energy, Tokyo Gas published basic requirements for the purchase of biogas in April 2008. Since then, the company has made preparations to purchase and feed biogas into the city gas distribution network.